Dallas Cowboys defensive end DeMarcus Ware (94) tackles Philadelphia Eagles running back LeSean McCoy (25) in the third quarter at AT&T Stadium. Defensive end DeMarcus Ware said the thought has crossed his mind that Sunday might have been his final game with the Dallas Cowboys. Declining production and frequent injuries could cause the Cowboys to part ways with the 31-year-old. Another option that Ware said he could embrace would be a pay cut. Ware is scheduled to count $17.6 million against the salary cap next season. 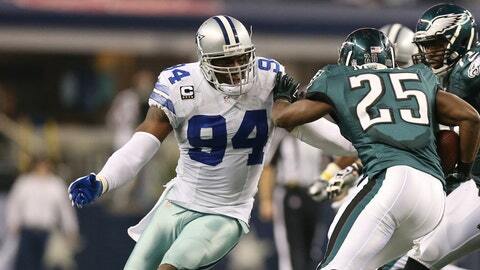 "At the end of the day, I’m a team player," Ware said, "and I’ll do what I need to do to help the team." Ware, who finished with four tackles, a fumble recovery and one quarterback pressure on Sunday, turned in his worst statistical season of his nine-year career. The seven-time Pro Bowler finished with a career-low six sacks. Ware has been battling elbow, back and quadriceps injuries throughout the season.